According to the Center for Disease Control and Prevention, cardiovascular disease is the leading cause of death among Latinos in the United States. In a recent survey by the CDC, Latinos reported having high blood pressure and nearly a third with high blood pressure were not taking medication to reduce the risk for heart attack and stroke. 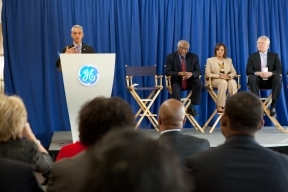 In order to combat heart disease and stroke among Chicagoans, the GE Foundation announced a $2.2 million grant to expand Chicago’s cardiovascular screening program, Keep Your Heart Healthy (KYHH), during a press conference at Family Focus, situated in Humboldt Park, on Tuesday morning. The Developing Health grant is a partnership among the Chicago Department of Public Health (CDPH), Northwestern University and local community organizations, to help screen 50,000 residents for cardiovascular disease by 2017. KYHH is modeled after a pilot program funded by the GE Foundation in 2012 which focused on community outreach. KYHH will collaborate with health professional students, community health workers, and local health centers to provide Chicagoans with education and resources they need to decrease cardiovascular disease risk factors. The commonness of cardiovascular disease is a key public health issue in Chicago. According to the CDPH, cardiovascular disease is the leading cause of death in a city where 30 percent of the adult population has high blood pressure. Each year, one-in-four deaths in Chicago are related to the disease. This year, Northwestern University Feinberg School of Medicine students will work with Family Focus in North Lawndale and the Diabetes Empowerment Center in Humboldt Park to conduct weekly heart screenings. Students will also work with community health workers at large-scale screening events in South Chicago and Douglas. The program will expand by two neighborhoods each year of the grant so that by 2016 KYHH will serve eight communities in Chicago.